Emory Washburn was a United States lawyer, politician, and historian. 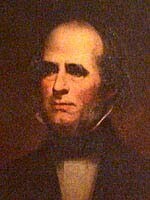 He was Governor of Massachusetts for one term, and served for many years on the faculty of Harvard Law School. His history of the early years of the Massachusetts Supreme Judicial Court is still considered a foundational work on the subject. Born in Leicester, Massachusetts, Washburn attended Dartmouth and Williams before studying law. After establishing what grew to become a successful and distinguished law practice in Worcester, Washburn entered politics as a Whig. After serving several years in the state legislature, he was elected governor in 1853. Despite his support for a reform-minded agenda, he was swept out of office on the Know Nothing tide in 1854. Washburn joined the faculty of Harvard Law in 1856, where he was a popular and influential figure until his retirement in 1876. His publications, in addition to his history of the SJC, include a history of his hometown of Leicester and numerous treatises on legal subjects.